Duncan (Louis Butelli) Macbeth, 2018. When Davenant adapted Macbeth, he aimed to update Shakespeare’s antiquated play for his late 17th-century audience. He opted for simplicity: fewer characters (14 characters as opposed to 26 named characters in Shakespeare’s version), shorter speeches, and clearer moral lessons. 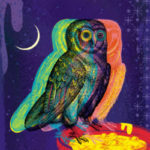 What complexities he cut from Shakespeare’s play, he replaced with music and spectacle. For a 21st-century audience, however, Davenant’s version of Macbeth may defamiliarize the well-known story and lines of Shakespeare’s tragedy. 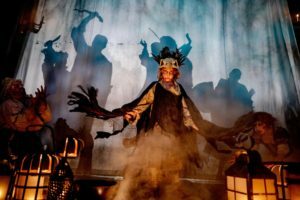 Therefore, one of the challenges of producing Davenant’s Macbeth was staging Restoration spectacle, music, and acting in ways that would make sense to a modern audience. Inspired by a BBC podcast on Bedlam, director Robert Richmond chose a play-within-a-play concept set in Bethlem Royal Hospital, as an answer to this challenge. The long history of the asylum shares intriguing intersections with theater and legend—teeming with creative potential for the production. After the Great Fire of London in 1666, the institution moved from its original location over a faulty sewage system and was reconstructed on a new site at Morefields. A charity performance was held to raise funds for the hospital. We don’t know what was performed at this charity event, but we do know that Bedlam already had a reputation as a “theatre of madness,” a tourist attraction where paying visitors could see society’s mentally ill. Bedlam had also found its way into popular culture of the time such as plays, art, and ballads. 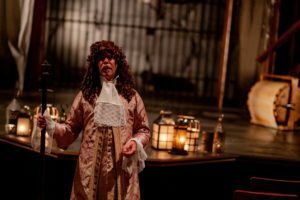 Based on the asylum’s historical reputation, we used the idea of the inmates in 17th-century Bedlam performing a play to incorporate elements of Restoration theater within our production of Davenant’s Macbeth. Macbeth (Ian Merrill Peakes). Macbeth, 2018. Scenic design for Macbeth. 2018. Restoration theater often featured elaborate stage machinery, effects, and spectacle. 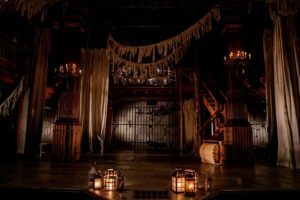 Aligned with our imagined charity performance, our set design features an interpretation of bare Bedlam itself—barred entrances, filthy curtains, hanging rags, and low-lit candelabras. 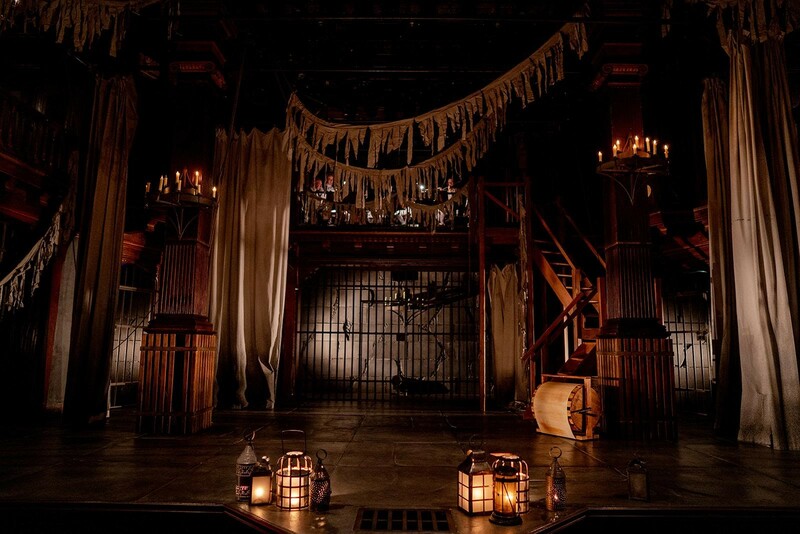 In center stage is, in Richmond’s words, a “troubled sewer” which not only functions as the witch’s cauldron in Macbeth, but also as the source of Bedlam’s rising filth and seepage. Makeshift stage machinery and props such as chains, surgical knives, a rag doll, a wind machine, and a thunder sheet for sound effects all acknowledge the openly theatrical nature of the inmates’ performance. By manipulating these simple pieces onstage, the inmates create their own open-handed versions of machinery, effects, and spectacle. Lady Macbeth (Kate Eastwood Norris) and Macbeth (Ian Merrill Peakes). Macbeth, 2018. Macbeth (Ian Merrill Peakes) and Lady Macbeth (Kate Eastwood Norris). Macbeth. 2018. 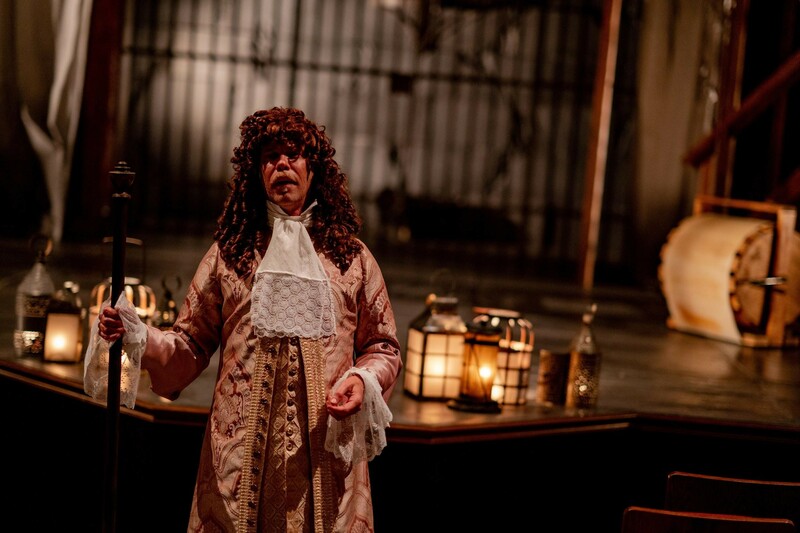 Another aspect of Restoration theater we incorporated through the Bedlam frame was the period’s acting style. Although we know this style was characterized by conventional gestural language, we don’t know how these gestures worked in performance. Therefore, “we needed to create a world in which more performative acting could take place,” remarks Richmond. Several famous historical inmates had been known for disruptive social and political behaviors—prophecy, attempted regicide, sexual deviancy, and murder–which were unexpectedly similar to characters in Macbeth. So we borrowed their stories to forge connections between inmates in the Bedlam frame and the play. As Richmond explains, “ Each inmate plays a character which is related to either their present or future mental condition. ” Drawing from 17th-century records of symptoms of mental illnesses, the actors experimented with their own vocabulary of gestures to express these mental conditions and behaviors. These gestures might be repressed or intensified by repeating words in the script such as “blood” and “ambition.” They might be inspired by repeated textual references to body parts such as hands, eyes, or the head. These gestures create an intriguing duality in the actors’ performance as the audience may see both the Macbeth characters and the inmates playing those characters simultaneously portrayed. These stylized gestures formed our own version of a demonstrative Restoration acting approach. Additional inspiration for developing the Bedlam play-within-a-play concept was found in Davenant’s script. Repeating images in the text such as “night,” “disease,” and “filth” are captured in artistic elements. Gradually, costumes become dirtier and dirtier, reflecting Bedlam’s rising sewage problem and Scotland’s increasingly “foul disease.” Sound and period music become eerily dissonant and contorted. Chiaroscuro lighting and larger-than-life shadowplay create a phantasmagoric relief to Bedlam’s dank, mad world. Fleance (Owen Peakes). Macbeth, 2018. Witch (Ethan Watermeier), Fleance (Owen Peakes) and witch (Rachael Montgomery). Macbeth, 2018. 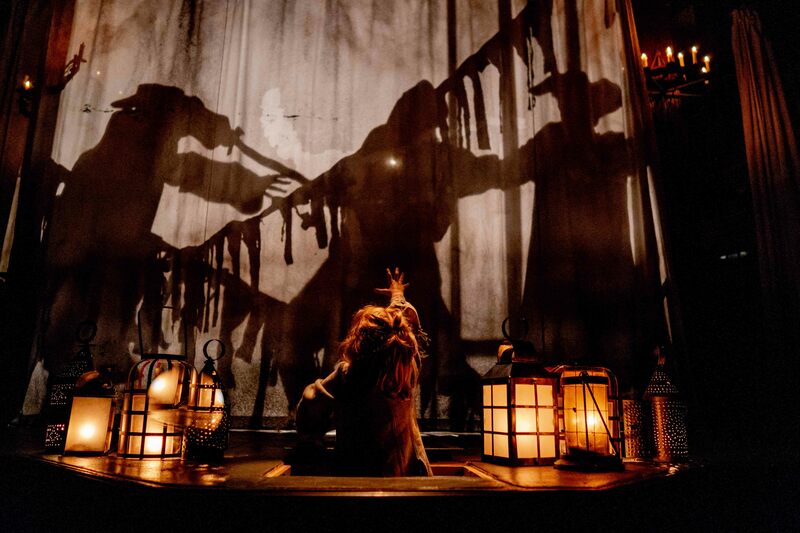 Macbeth characters take on new dimensions within the walls of Bedlam. The witches, for example, symbolize madness, rather than evil. 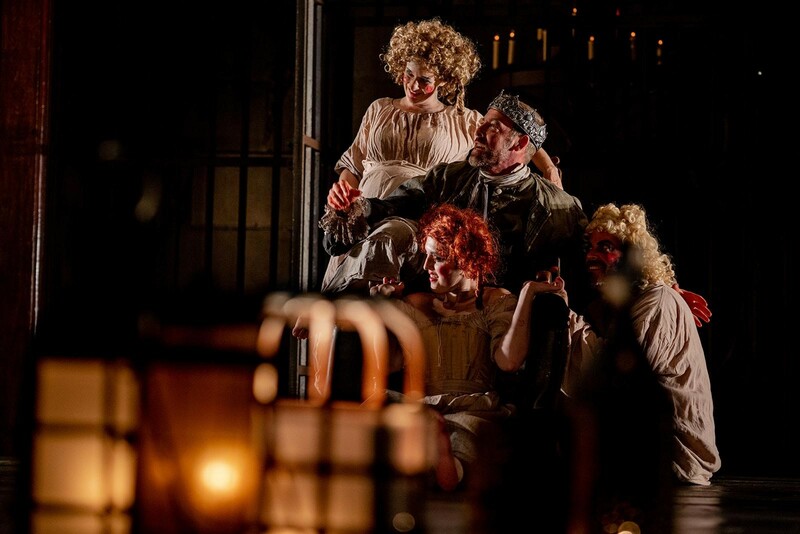 They are one of the strongest manifestations of Bedlam as their madness permeates the play. They rejoice in a reversed world “where good kings bleed” (2.5) as their cauldron bubbles with ingredients that “will make the charm grow madder” (3.5). They infect Macbeth and Banquo with the maddening desire for forbidden knowledge. Their prophecies propel both Macbeth and Lady Macbeth’s unchecked ambition to take a shortcut to future glories. But the witches in Davenant’s version are also the focal point of Restoration music and spectacle. Their songs and conjurations invoke fatal visions of daggers and ghosts. They implicate dark spirits, the goddess Hecate, and even Fleance with their witchcraft. And yet, their ubiquity in the production reminds us that Bedlam is always present. The witches (Rachael Montgomery, Emily Noël, and Ethan Watermeier) with Macbeth (Ian Merrill Peakes). Macbeth, 2018. The Macbeths, who famously descend into fits of mental illness, also are seen anew. As the true villains in Davenant’s version, the Macbeths are examples of a cautionary, moral lesson. Once Macbeth surrenders to the witches’ madness, he gradually loses sense of himself, his relationships, and duty. His ambitious choices lead him not to glory, but to deep-seated guilt, insomnia, and hallucinations. His tortured mind remains “full of scorpions,” plagued by “restless agony” (3.3) and a “strange infirmity” (3.5). Lady Macbeth also suffers from a disturbed sickness, but her madness in Davenant’s version is even more pronounced than in Shakespeare’s, as Duncan’s ghost haunts her. Eventually, the Macbeths’ internal bedlam heightens the literal Bedlam all around, and both Macbeth and Lady Macbeth become victims to their own madness. The dynamic frame in our production, Bedlam—the historical asylum and popular notions of chaos and madness, affords rich creative avenues for bringing Restoration theater and Davenant’s Macbeth to the modern stage. Through Bedlam we experience, in the words of Samuel Pepys, the “strange perfection” of Restoration theater, while also savoring this 350-year-old version of Macbeth in its groundbreaking revival. Thanks to Sarah for her insightful thoughts on the production! Macbeth is on stage until September 23. For tickets and more information, visit us online or call the Folger Box Office at 202.544.7077.